For over a century, black elites have pushed improved “race relations” instead of redistribution as the solution to inequality. "The Union as It Was. The Lost Cause, Worse than Slavery." Illustration by Thomas Nast, 1874. When black progressives today think about the Civil War, they are often more struck by what didn’t happen than what did. What this narrative of unremitting bleakness overlooks is that the South chose armed rebellion in order to maintain political control over its system of labor — a system that enslaved blacks while impoverishing white agricultural and industrial laborers. From the standpoint of Southern planters and industrialists, the most terrifying prospect of emancipation was the possibility that laborers, black and white, would eschew elite guidance and wield political power in the form of the ballot and office-holding to further their own interests. It came as no surprise, then, that when former slaves did begin to make this prospect a reality, Southern elites responded not only with violence and political fraud, but also with an intellectual campaign carried out in newspapers, journals, fiction, poetry, and historical writing to demonstrate the incapacity of blacks for self-government and the corruption that would ensue when the unlettered and inexperienced held the reins of power. Indeed for nearly 130 years, black elites in the United States have been offering up improved “race relations” rather then interracial workers alliances against capital as the primary solution to American inequality. From the moment the Civil War ended, the question of what an American society without slavery would look like dominated political discussion. If the inaugural issue of the Nation magazine opined that “Nobody whose opinion is of any consequence, maintains any longer that [blacks’] claim to political equality is not a sound one,” the actual picture was more complicated. While many black commentators and freedmen expected emancipation to usher black Americans fully and without restriction into the nation’s civic, social, and economic life, relatively few white Americans — even among those who abhorred slavery and championed the freedman’s political rights — felt similarly. And while many Americans, black and white, celebrated the idea that the freedmen would now be able to join the ranks of wage laborers, few of either race saw this change as a significant step towards enhancing the political and economic power of workers generally against employers and landowners in the immediate aftermath of the war. Recent commentary on the limits of emancipation has typically made much of the lack of racial egalitarianism within the Republican Party and even among abolitionists, seeing within this the seeds of subsequent political defeats. In bringing slavery to an end the Civil War opened up contestation not only over the place that former slaves would have in American society, but also over the role that wage earners and women would play in a post-slavery political order. Egalitarian visions, however, were met by concerted forces that did not want the end of slavery to lead to the complete emancipation of wage laborers. That is, any newly won freedoms should not address the way that market coercion severely limited the capacity of working Americans to control their lives and destinies. And while this limitation would ultimately prove equally consequential for the subsequent history of social justice, it has often been hidden by the significant shadow cast by the narrative of American racism and white supremacy. Steeped in the free labor ideology of the North, De Forest’s novel spliced a love story onto a realist account of the war in a way that reflected even as it sought to suppress tensions within the idea of free labor that had come to mark the difference between North and South. In finally uniting the book’s hero Captain Edward Colburne of the Union army with erstwhile Southern sympathizer, Miss Lillie Ravenal, whom he has loved from the beginning of the novel, De Forest reveals that his view of the ideal free laborer was less the “propertyless proletarian” whose “freedom derived not from the ownership of productive property but from the unfettered sale of . . . labor power — itself a commodity — in a competitive market” than the “independent proprietor,” who had long been identified as being independent enough to secure the freedom of thought and action necessary for responsible citizenship. We can see the inadequacy of wage labor in Colburne’s assessment of his economic situation after the war. Here we learn that “his salary as captain” had enabled him “to lay up next to nothing,” and that rising gold prices had diminished “the cash value” of what salary he did earn. These dire prospects, however, do not turn out to be ultimately damning. Trained as a lawyer and in possession of a small inheritance from his dead father, Colburne, by partnering with a colleague, is able in short order to find himself “in possession of a promising if not an opulent business” and is ready to assume his role as head of household with the widowed Lillie Ravenal as his wife and her son as his stepson. So, with lectures to the ex-slaves about the virtue of labor, sobriety, and the like, Dr Ravenal sets out to put black labor to work for wages. A Confederate counterattack cuts short his “grand experiment of freedman’s labor,” but not before the novel has had time enough to make clear its view that while reconstructing black labor may ultimately succeed, the effort will take time because the habits and attitudes ingrained by a history of enslavement will not disappear overnight. Undergirding De Forest’s vision of black freedmen gradually acquiring the skills and habits necessary to become prosperous cooperative laborers is what Eric Foner terms free labor’s belief that “a harmony of interests” defined the relation of capital to labor. The conditions necessary for capital to profit from its outlays were deemed to be those that were most conducive to the flourishing of labor. Class conflict could be imagined only in terms of deficiencies of character among the uncooperative. Thus, despite their sympathies for the freedmen, black and white elites in the North generally embraced a view of the recently emancipated as a population in need of tutelage and leadership rather than as peers who had the capacity to present their own visions of social and economic life. Black novelist, former abolitionist, and temperance advocate Frances E. W. Harper begins her 1892 novel, Iola Leroy, or Shadows Uplifted , with depictions of illiterate and semi-literate black slaves debating among themselves the best course of action to take in response to the approaching Union army. These sentiments were echoed by black social reformer, Anna Julia Cooper, in her landmark 1892 work of cultural commentary, A Voice From the South , which famously asserted that it would only be when the black woman was able to enter into American society on terms of equality that true social justice would be achieved. While on Cooper’s account genteel black women should expect acceptance as full equals, laboring blacks were to be prized for racial qualities that guaranteed their capacity as tractable workers. To be sure black workers were not often met with open arms by their white counterparts. And it was not always the case that black novelists assumed innate antagonism between black and white laborers. J. McHenry Jones’s 1896 novel, Hearts of Gold , depicts Welsh miners in a Southern town who, moved by their sense that convict labor “degraded” labor generally and by “a deep-seated hatred . . . against systematic cruelty,” harbor a black runaway from a convict labor camp and then march en masse to destroy the camp and liberate its inmates. Nonetheless, the representational tendency to align black Southern labor with the interests of their employers also reflected the continued commitment of black elites to the idea “that a community of equal men could be created by allying labor (blacks) and capital to produce material progress and enlightenment,” rather than by allying black laborers with their white counterparts. Instead of building the political power of labor, they called for building the integrity and esteem of the black race. 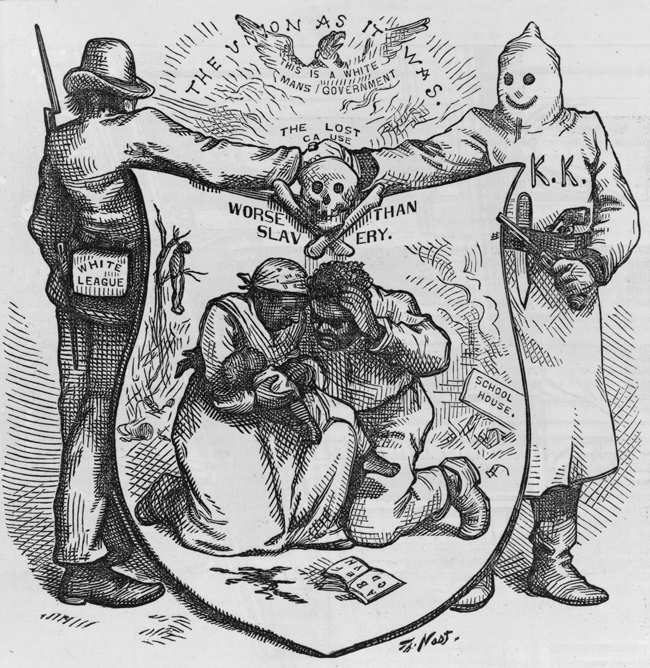 But whether these representations of black and white labor were disparaging or laudatory, what connected them was that they were, in some way or another, a response to the rise of the Southern Alliance in the 1880s, which was followed by the emergence of the Populist Party in the 1890s. More to the point, according to Judith Stein, the Southern Alliance was paralleled by and helped fuel the Colored Farmers Alliance, which grew to encompass more than a million black farmers by the early 1890s. While in many cases the political organization of black farm laborers strengthened the hand of black political elites in seeking concessions from white industrialists and landowners, the efficacy of these alliances also challenged the ability of these elites to set the terms and goals of black political activity. Black elites had sought to assure whites in both the South and the North that black political participation was consistent with the idea of rule by the “best” men of society. In principle then, if not always in fact, the stance of black political elites placed them at odds with the idea that relatively uneducated laborers could wield political power effectively. Thus, in novel after novel produced by the black political class, writers inserted scenes where unschooled black laborers pleaded for the leadership and guidance of their black genteel betters. Washington’s rise as a political force in the South coincided with the rise of Populism. The ability of Populists to mount successful political challenges to Southern Democrats depended on the votes of black Alliance members. It was their awareness of this fact that drove white industrialists and planters in the 1890s to secure the dominance of the Democratic Party by pursuing across-the-board disfranchisement of blacks as well as many poor whites. Jim Crow America was the result of a successful counterrevolution against an interracial labor threat — a counterrevolution aided and abetted by the rise of Bookerism and the Tuskegee Machine. Viewed against the rise of Populism one can see that the Civil War, by granting blacks political rights, set the stage for what would become one of the most profound challenges to capital in the history of the United States. That the Populist challenge was defeated does not diminish its significance. And given that it was only after the defeat of Populism that disfranchisement and Jim Crow were able to succeed suggests the potential instructiveness of that history for the present moment, a history that does not attest simply to the periodic reemergence of white supremacy across time as Alexander and so many others have alleged. Rather, if racialized forms of exclusion tend to rise in the wake of successful efforts by industrial and financial interests to undermine the political power of labor, to make our primary task that of addressing “racial divisions and resentments,” as Alexander calls for, risks giving pride of place to a new era of race relations, and not the broader vision of social justice that she describes at the end of The New Jim Crow . Then, as now, the most reliable path to a progressive politics that produces true justice and human rights is that which begins with building the political power of workers. It is this proposition that has often made elite opponents of white supremacy — both black and white — deeply uncomfortable. Kenneth W. Warren is a professor of English at the University of Chicago. His most recent book is What Was African American Literature?